AAVIN Milk Recruitment 2018 Notification For intake of 275 Senior Factory Assistant Jobs is released by the Tamil Nadu Co-operative Milk Producers’ Federation Limited, Aavin on 24.06.2018 on www.aavinmilk.com for 8 districts of Tamil Nadu. And the Online Application which is active is also placed by the AAVIN officials on www.aavinmilk.com and contenders may register from 24th June to 16th July 2018. TN AAVIN Milk Senior Factory Assistant Recruitment 2018 Notification is placed on the Site www.Jobschat.in for the Applicants who are looking for the Tamil Nadu State Jobs. Tamil Nadu Co-operative Milk Producers’ Federation Limited, as a part of selecting for 275 Sr Factory Assistant Posts in the districts of Chennai, Erode, Salem, Tanjore, Thiruvannamalai and other. For this, Not only particular District Contenders, Persons belonging to the Tamil Nadu State also apply if they complete their HSC or ITI and having the Experience in the respective field also apply for this. Candidates can get the TN AAVIN 275 Senior Factory Assistant Notification 2018 with Application Form is also placed here and the aspirants need to fastly Apply for this Jobs in Online through www.aavinmilk.com before 16th July 2018. Those who Possess the Higher Secondary Certificate i.e 12th Standard or ITI in Any Trade and Every Applying candidate on the date of the Notification for the Senior Factory Assistant Posts should possess an adequate knowledge of Tamil Language. Contenders Must have the Age Limits as specified here and the Age Relaxation will be accepted for the Eligible Contenders who possess the Respective category. Registrants definitely pay the Fee which is specified here along with Service Charge in Online Mode through Online Banking or Credit/ Debit Cards. The Tamil Nadu Co-operative Milk Producers’ Federation Limited, Aavin will choose the Candidates based on the following rounds. AAVIN Milk Board offer the Postulants who are qualified for the 275 AAVIN Senior Factory Assistant Recruitment 2018, will get the Consolidated Remuneration as per the Norms. 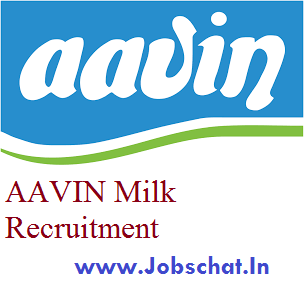 AAVIN Milk Recruitment 2018 published for employing a total of 75 Junior Executive Posts. So the Aspirants who wanted to apply this AAVIN Milk Junior Executive Recruitment 2018 notification the application has started and the application closing date is 25th June 2018. To Apply for this Recruitment through the official website @ aavinmilk.com or else visit our site jobschat.in. AAVIN Milk Recruitment 2018 Announced total 75 posts of Junior Executive under Authority of the Managing Director Tamil Nadu Co-operative milk producers’ Federation Ltd. The aspirants who wanted to apply this TN AAVIN Milk Jr Executive Recruitment 2018 first check the details like job type, location application fee and pay scale. The candidates who satisfied these instructions can apply this AAVIN Milk Recruitment 2018 through official website @ www.aavinmilk.com. As there are 75 Posts, 66 are allotted for Chennai, 03 to Erode and 06 Posts for Thiruvananthapuram Regions. Contenders by searching all these can register for this jobs clearly without fail by providing all the details. For Further more updates regarding the Current & Latest Results, Recruitments, and Admit card, visit our site Jobschat.in. Managing Director of Tamil Nadu Co-operative milk producers’ Federation Ltd Is going to fill up the 75 Jr Executive Posts under the branches of Chennai, Erode and Thiruvananthapuram. This the great opportunity for the Tamilnadu state Graduates. The Candidates who are applying for this recruitment can check the dates of the application process for Erode And Coimbatore. For all the regions, the application closing date is 25th June 2018. So, candidates hurry up their application process. While filling up the application may arise some questions at that time follow the official site And also get the Latest Tamilnadu govt jobs here. Aavinmilk.com இல் 75 ஜூனியர் எக்ஸிக்யூடிவ் இடுகைகள் மொத்தமாகப் பயன்படுத்துவதற்காக வெளியிடப்பட்ட ஏவினின் பால் ஆட்சேர்ப்பு 2018. 2018 ஆம் ஆண்டு ஜூன் மாதம் 25 ஆம் தேதிக்கு முன் இந்த AAVIN பால் ஜூனியர் எக்ஸிக்யூடிவ் ஆட்சேர்ப்பு 2018 க்கு விண்ணப்பிக்கலாம். Though we placed the Detailed Info about the AAVIN Milk Recruitment 2018 For Junior Executive Here, we suggest the applicants check the Advertisement once. Societies, Chennai. Exemption for holders of a degree in B.A (Co.op.) or B.Com (Co.op) from passing Cooperative Training. Aspirants must possess the Lower and Upper age limits of 18 and 30 years as on date 01.07.2018 and for age relaxation, the aspirants must check the AAVIN Milk Recruitment 2018 For Junior Executive Jobs and There is No Maximum age limits for BC/MBC & DNC/SC/ST candidates. Coming to the Registration Fee, the Officials on the AAVIN Milk Recruitment Notification 2018 For 75 Jr Executive Jobs here. The AAVIN organization will only organize the following Two rounds. Those who cracked the recruitment rounds of TN AAVIN Milk Jr Executive Recruitment will receive the following package. Junior Executive – Rs.19,500/- to Rs.62,00/- Per Month. Open homepage, Check the Latest Updates tab and click on AAVIN Milk Recruitment 2018 Notification For 75 Junior Executive Jobs. Click on the notification and check complete details listed. And employable ones must Fill up the application form as per the instructions are given by the officials. Finally, submit your application form by uploading your certificates like ID proofs, education certificates by paying a fee to the address given below. Take a hard copy of your submitted application form. AAVIN Milk Recruitment Notification For Jr Executive: The Aspirants in Tamilnadu get ready for the latest recruitment for 75 vacancies. This recruitment announced by Managing Director Tamil Nadu Co-operative milk producers’ Federation Ltd. For this recruitment, the candidate must be completed the Graduation From An Authorised Board Or University. And also we provide all information regarding this notification on our website jobschat.in. Here the selection process is written test and final interview. For this written test we provide the Syllabus for the candidate to do well in the test and wish to proceed with the Further Process of the Recruitment. AAVIN Milk Recruitment 2018 For the written test we provide also Previous Papers for the candidates. And also the officials release the admit cards very soon. after completion of the written test, the shortlisted candidates requested to attend the final interview. So, the candidates must download the papers and start their preparation. More information regarding this notification follows our website jobschat.in.